If you weren’t quick enough to grab tickets for Dierks Bentley last year, fear not! 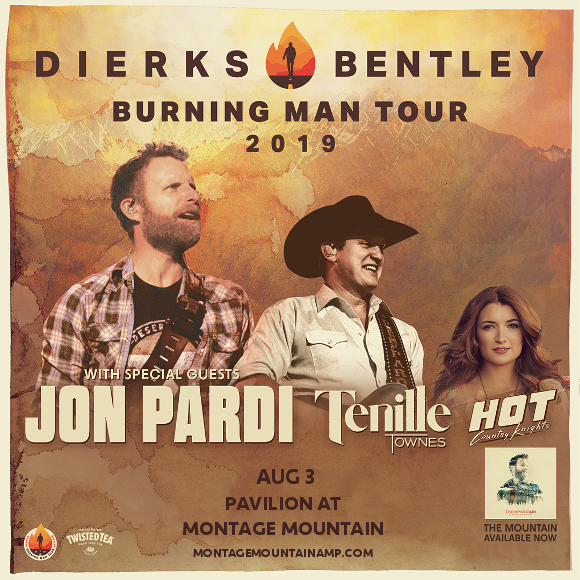 The relentless performer is back on the road in 2019 with the Burning Man Tour – coming to the Pavilion at Montage Mountain with special support from Jon Pardi and Tenille Townes! But you’d best be fast this time around, ‘cos these tickets are’t going to last long either! Grab yours NOW and get ready for an epic summer show on Saturday 3rd August 2019! Are you ready to catch this incredible trio of acts in one unforgettable performance?? Then get those tickets right this second, while they last! !